At the Destination D event at Walt Disney World on Saturday, there were a number of announcements made about the parks. We’ll get to our commentary about all of these announcements in the next few days, starting with the coverage of nighttime spectaculars at Hollywood Studios at Disneyland. Both of these additions are nighttime shows centered around the park icon. Disneyland will add a show called “Disney Mix Magic” featuring original music, projections throughout Main Street USA, and (possibly) fireworks. Along with the new nighttime show at Disneyland, Mickey’s Soundsational Parade will be returning to the park as a daytime parade. Both of these will come to the park in January. All of this will fall under Disneyland’s Get Your Ears On – A Mickey and Minnie Celebration. Along with the show and parade this festival will celebrate Mickey’s birthday with merchandise, food and entertainment. At Disney’s Hollywood Studios, a new projection show is set to debut in May 2019. The new show will be called “Wonderful World of Animation” and I would assume it’s replacing Disney Movie Magic. To read more about these additions, and ones that we’ll cover in a separate blog post, click here. On to our commentary! I started with these additions because the news is all positive. Now, that I think about it maybe I should have started with bad news because that’s what I always want first when someone says, “I have bad news and good news, which do you want first?” Too late now! The Disneyland news is what I’m most excited about. Frankly, I think not having a daytime parade in a castle park is unacceptable. Even though I’m not much of a fan of Mickey’s Soundsational Parade, just having it return will benefit the park. I am looking forward to the addition of Mickey’s new float and hope that there was some thought put into it and it’s not just mailed in. 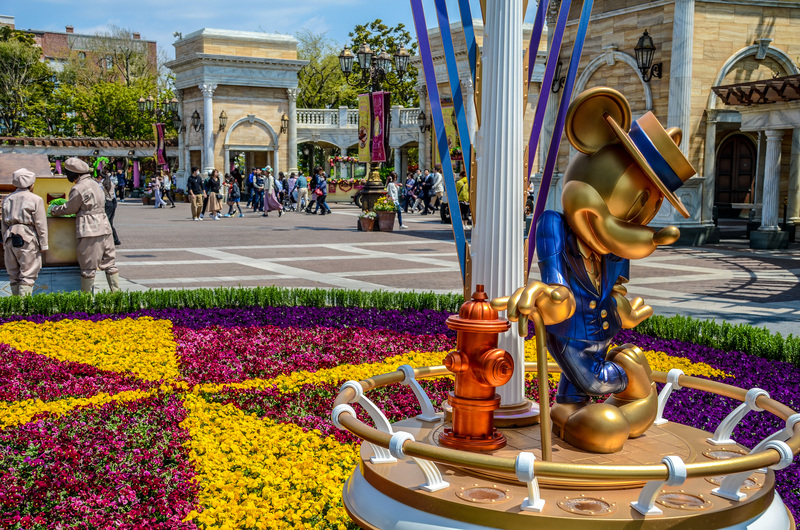 Likewise, the quasi Mickey Festival is a nice addition. I don’t think any of these announcements are worthy of making a special trip for, especially these first two, they are a nice touch for those already visiting. I’m excited and curious about what temporary entertainment may be added. I’m far more excited for the addition of “Mickey’s Mix Magic” although a few questions remain. The first of those is why they didn’t come up with a better title. Jokes aside, Disney has had great success adding nighttime shows and spectaculars over the last few years and I wouldn’t expect anything different here. Whether this is the new nighttime fireworks show or just a projection/dance party show remains to be seen. If this is added along with the existing fireworks show, Remember… Dreams Come True, then this is an excellent addition even if “Mickey’s Mix Magic” is somewhat lacking. The concept art reminds me of the visually stunning (and now extinct) Disneyland Forever. 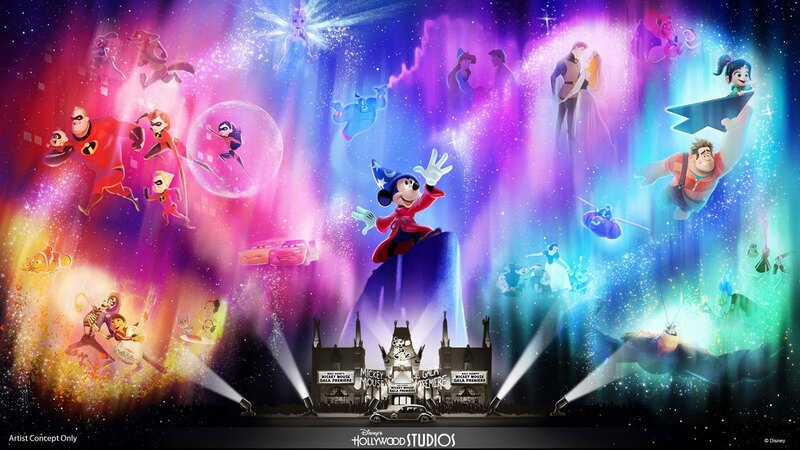 One of the renderings has fireworks in the sky and the other doesn’t so I have no clue if this is going to be the main show going forward or not. I would guess no due to the fact that it’s referred to as a dance party in the release. 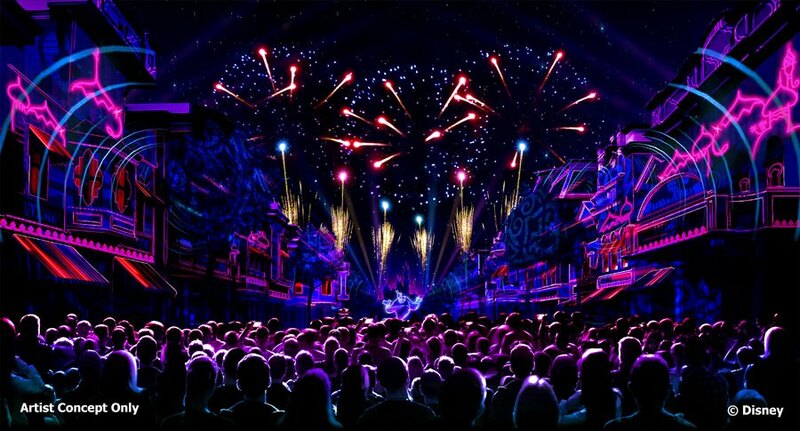 On the other hand, the concept art below doesn’t look like the usual fireworks for a projection show. We’ll update when we know more. Moving across the country to Hollywood Studios, I’m very optimistic about the projection show being added to the park. Melissa and I both enjoyed Disney Movie Magic but I wouldn’t call it extraordinary by any measure. Instead it was simply a nice addition before the real nighttime spectacular. I assume that “Wonderful World of Animation” will also fall under that category. While Disney Movie Magic is well done, I can’t say the subject matter (Disney’s live action films) interests me much. Disney animation is far more interesting and iconic, making the show more appealing to me. Along with that, having a projection show based on Disney animation on an attraction (Mickey and Minnie’s Runaway Railway) that celebrates Disney animation makes sense. All in all, these are a few excellent additions to their respective parks. Admittedly, I’m not nearly as picky about what shows go into parks as I am about attractions. That means I won’t typically have objections about the concept of shows. Of course, these shows could end up being terrible but Disney deserves the benefit of the doubt considering their recent nighttime show additions. Adding entertainment to the parks is important and after a recent string of taking entertainment away, this news is very welcome. 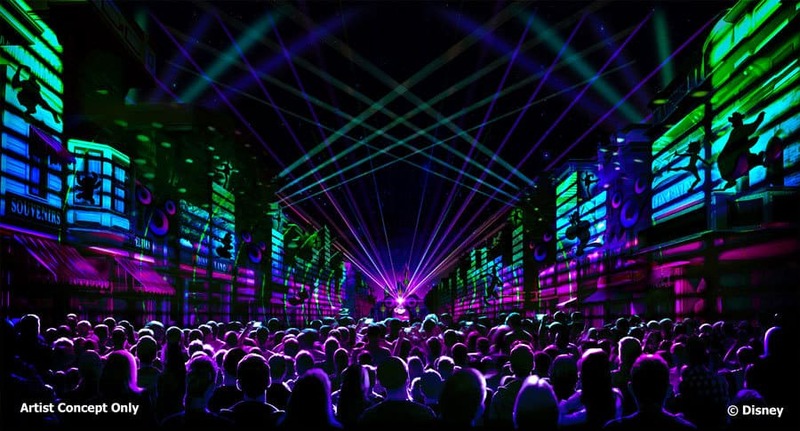 What do you think of these new nighttime shows coming to Disneyland and Hollywood Studios? Let us know in the comments. 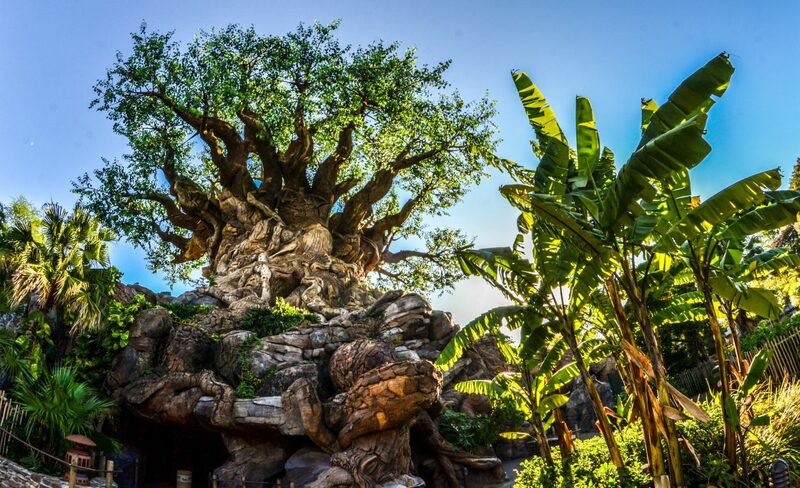 We hope you enjoy what you are reading here on Wandering in Disney. You can subscribe to the blog via WordPress or email on the right side of this page. Thank you for reading, we really appreciate it!